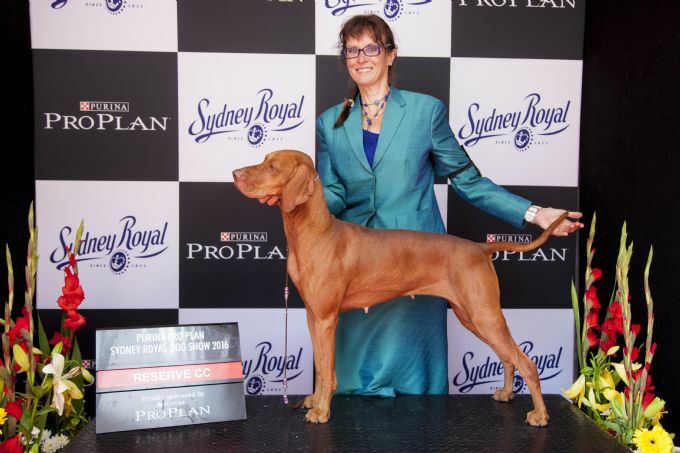 · Baby Puppy in Specialty Show at the NSW Hungarian Vizsla Club Show in October 2012 under Mr D Connolly (Ire). "Lovely baby of beautiful type. Excellent head with correct flew and beautiful dark eye. Lovely substance for frame and excelling in front, forechest, neck, topline, croup and tailset. This girl exhibited a nice easy profile gait and was very sound out and back. Definitely one for the future!" · Intermediate in Group at the Gunning AP & I Society Show under Mr T Tancred in February 2014. Critique of Avant Tout at the March 2016 Specialty (where she placed second in the Australian Bred class) included “nicely balanced. She was easy on the move and very well conditioned. Nice depth of chest, ribbing, short in loin & arched forechest”. Most days of the month Avant Tout is just a regular member of the Metropolis pack. She is an excellent example of the wisdom of allowing the puppy to pick you, rather than you picking the pup. Fortunately for Robyn Avant Tout was also the pick of the litter! She has an independent determined personality like her father, combined with her mother’s sweet tractable nature. She is also a mighty hunter, and self-confident. She has chosen La Cygne for her role model, and likes to dominate her brothers. She has mastered stepping up and down off the 1.5m high loft bed, and comes and goes at will.